Officers' Group, Special Constabulary, R.I.C. ('A' category). Subject: Officers' Group, Special Constabulary, R.I.C. ('A' category). (1) District Inspector J.L Truran ( ). Location: Maghera Police Station, Co. Derry. 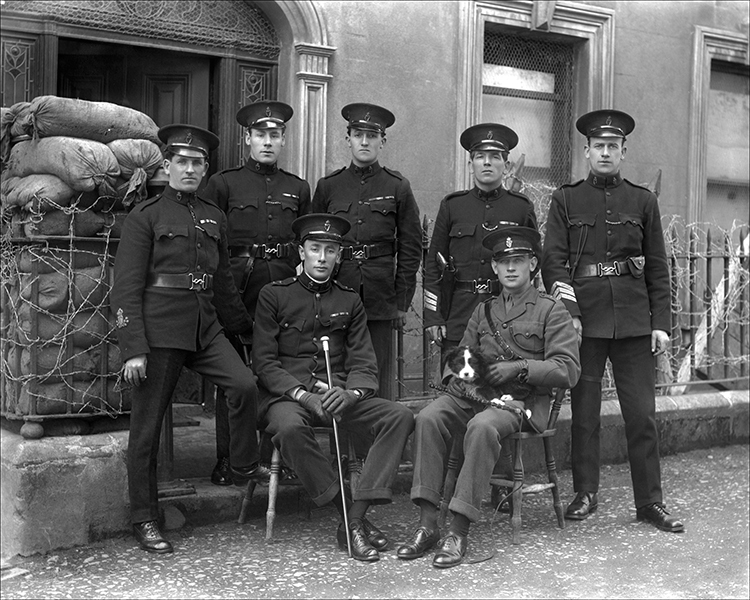 Costume: (Front row): (1) Uniform, District Inspector, Royal Irish Constabulary; (2) Service Dress Uniform, Officer, military; (back row): (1) Uniform, Head Constable, Royal Irish Constabulary; (others) Uniform, Sergeants, Royal Irish Constabulary. Acknowledgements: R.J.K. Sinclair, Curator, RUC Museum, Belfast. 1. Possibly the last such inspection of the Royal Irish Constabulary officers at the station named before the creation of the Royal Ulster Constabulary. (R.J.K. Sinclair, Curator, RUC Museum).